The Audi A8 is the car you buy when all your friends have 7-series or S-classes. What do you need to know before you buy a Audi A8? Don’t worry, we’ll tell you everything right here in our Buyer’s Guide. Look at that grille. Those LED headlights. That voluptuous interior. The Audi A8 drips with elegance, but does it in a way that’s subtle. And that’s what this class of flagship sedans is all about: Subtle elegance. No boistrous exhaust noises, no flashy paint schemes, no red brake calipers. The A8 and its rivals strive to isolate their occupants from the outside world with their magic carpet-like ride quality, copious use of sound-deadening and plush interiors. The Audi might do “subtle” better than any car in its class. Sure, it’s got a giant mouth, but it’s much more “under the radar” than the superstar Tesla Model S, the sporty 7-series, or the big chrome-grilled Mercedes S-class and its three-pointed star sticking from the front of its hood. The A8 is luxury for those who just want to cruise to their next business meeting without drawing too much attention. The third generation Audi A8 has been around in the U.S. since the 2011 model year. That car brought a new, lighter platform with much more use of aluminum. It got all-new styling outside, with prominent LED signature headlights and a big grille like its predecessor. The interior was also all-new and offered a new infotainment system and driver interface. The A8 debuted with a 4.2-liter V8, but in its second model year, that engine was joined by a 6.3-liter W12. In 2013, the 4.2-liter V8 got the boot in favor of a 3.0-liter turbo V6 and two versions of a 4.0-liter V8. The higher horsepower version of that 4.0-liter for the performance-oriented S8. The following year, a long wheelbase A8 joined the fray with a 3.0-liter diesel option. The 2015 A8 got revised front and rear fascias with completely new LED headlights and a new hood. This year’s 2016 A8 is similar to the 2015 model, except that it can only be had as a long wheelbase sedan, though the S8 performance version still comes in a standard wheelbase. Deciding which A8 or S8 to buy depends on what you’re doing with it. Will you be driven, or will you be driving? If you’re being driven, the $85,200 diesel A8L will give you plenty of luxury while keep your fuel costs down and your gas stops infrequent. Of course, you’ll want to add on the $2,500 Rear Seat Comfort Package to get massaging, ventilated power rear seats. To add that package requires the $3,950 Premium Package, which gets you vented front seats, head-up display, memory front seats and a top-view camera. But to get that Premium package, you have to add the $750 Cold Weather Package, which gets you heated rear seats and a heated steering wheel. But if you want to add the Cold Weather Package, you have to add the $1,000 Panoramic Sunroof. This is how buying luxury cars goes: you can’t just choose one thing. With Audi’s $5,700 Executive Credit, the cost ends up at $87,700 plus destination. 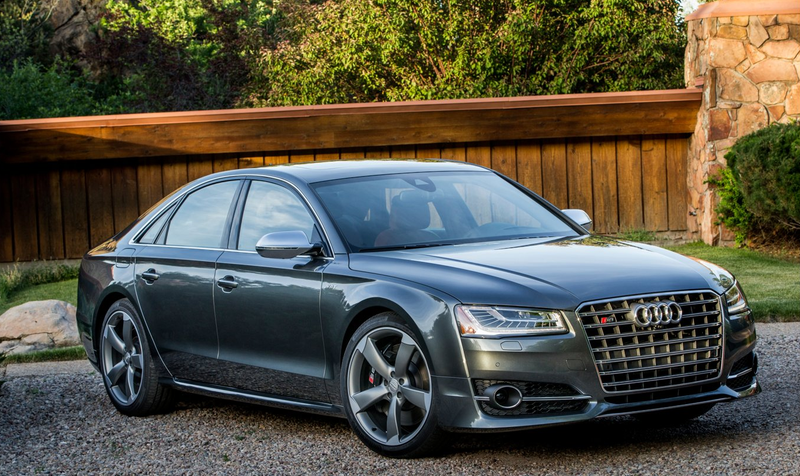 But if you’re going to be driving the car, the $114,900 520 horsepower Audi S8 is the one to get.